Between the blue of our great room and smokey chocolate of our living room we wanted a pretty neutral color for the entry way/staircase/hallway area. Pinterest- as I'm sure you know- is filled with many pins claiming to be the BEST gray color for any home in any room with any kind of light. They all of course look great on their respected blogs but we needed to try them out for ourselves. 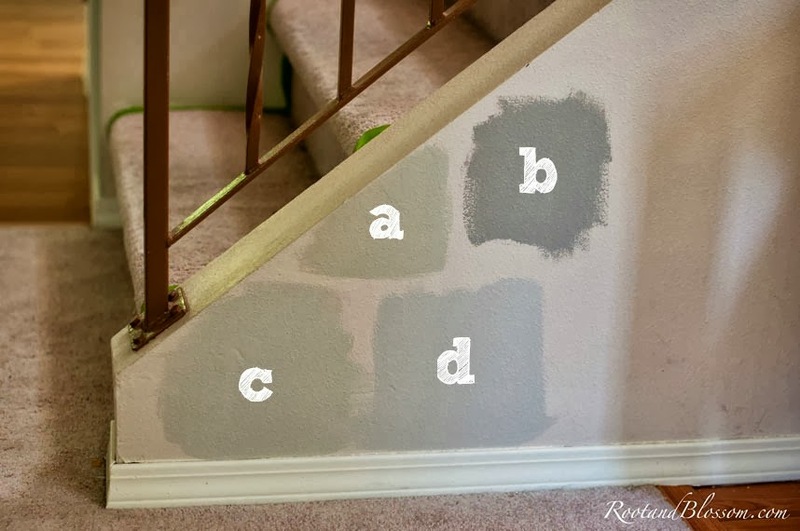 a: Bay Sands by Valspar 'aka Revere Pewter by Benjamin Moore' - Don't judge me but because I've seen this color more times than I can recall on Pinterest labeled as THE best paint color I wasn't sure what to do when it didn't quite hit the spot of us... In our house we notice too much of a green undertone. 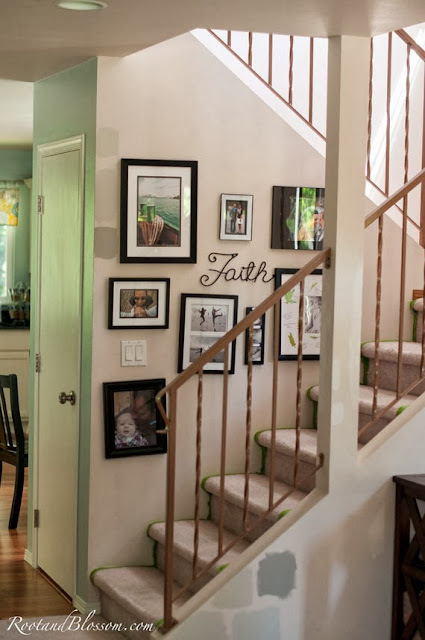 b:Woodlawn Colonial Gray by Valspar- We actually liked this color but since the color we chose was not only going to be in the bright entry way but also the dark hallway upstairs it was too dark for our us. c: Oatland's Subtle Taupe by Valspar- Christopher actually picked this color out on our second trip to Lowes when the first two choices (a and b) didn't work out. d: Behr Mineral - I love this gal's blog and swoon over her home so I thought her paint color would be a no brainer! We found it to be a tad too 'icy' for us. There is no reason we tend to go with Valspar over other paints other than I believe it tends to be cheaper but still great quality. If price wasn't an option I think we'd go with Benjamin Moore or Sherwin Williams. Honestly, any paint choice would have been better than what was already on the wall. 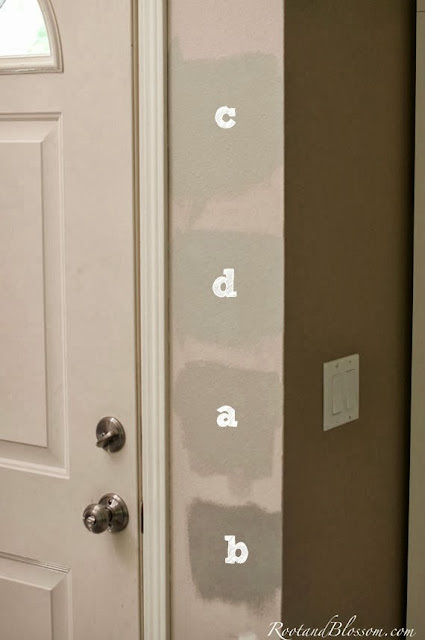 Not only was the previous paint job absolutely horrendous but after we moved in and started painting we realized that our walls were a pink tinted off white... PINK (post painting we noticed that our carpet is the same way too... awesome...)! Chris decided that we should go with option C. I wasn't sold on the choice and needed a lot of reassuring during the painting process but once it was on the wall I loved it! You'll have to come back tomorrow and see! I work for Benjamin Moore- Revere Pewter does have a little green in it, for sure. We have a fairly cheap line of paint (Ben, its only $55/gal). Just so you know though, the whole 'color match' from different companies does not always work. That color you have may not be the exact same as the revere pewter you'd get from the actual company. But usually its pretty close! Do you get a discount?! Gosh I would spend so much money if I worked there... You're cheap line is still more expensive than the stuff we get at Lowes. :) You are totally paying for quality with BM but the budget doesn't always stretch that far. I only get a 25% discount actually. Which isn't much, considering contractors get 20% off! harumph. I know most companies claim they're an exact match but I've had many people come in and get a color of ours to do touch-ups and then try to bring it back because 'it doesn't match, we originally bought it at _____ and forgot'. Nothing I can do about that, unfortunately. And yeah, our paint is still expensive. our Aura paint is $75 a gallon. like, seriously....who can afford that!? haha. C is pretty, I can't wait to see the finished look! can't wait to see how it turns out! picking paint colors is so hard! oh, and all the white looks lovely! you did a great job on the trim and the door! It's amazing what a difference it makes! picking paint colors gives me heart palpitations!! haha! But 'C' was what I would have picked too!! Can't wait to see how it turned out! Thanks! It takes a lot to get me motivated to paint but I always love the payoff. No joke! Talk about toying with an anxiety attack!